Luxury Resort Swimming Pool Fairfax Station - Land & Water Design, Inc.
A stately brick home sat tucked into the woods in Fairfax Station, a flat expanse of lawn stretching across the backyard. 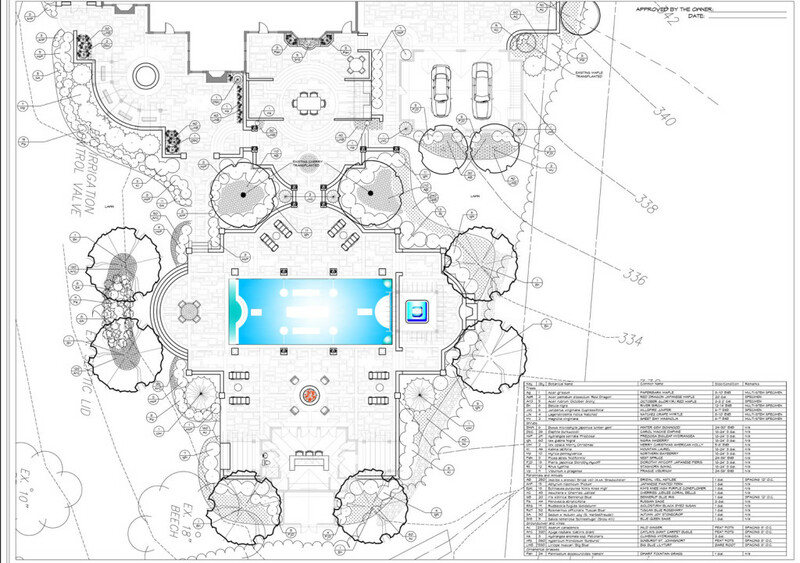 The client wanted more than a swimming pool, more than the cliche “backyard resort.” The client wanted a show stopper, and we made it happen. In many respects, the site for this Fairfax Station swimming pool and landscape project was not particularly challenging. Wide open lawn rolled gently away from the house, and much of the lot was already cleared. This allowed us, even more, freedom to address the ultimate challenge: determining exactly what our client wanted and giving him more than he thought possible. We knew we needed to incorporate a pool, pool house, a fireplace, plenty of patio space, and water features. The rest was up to us. 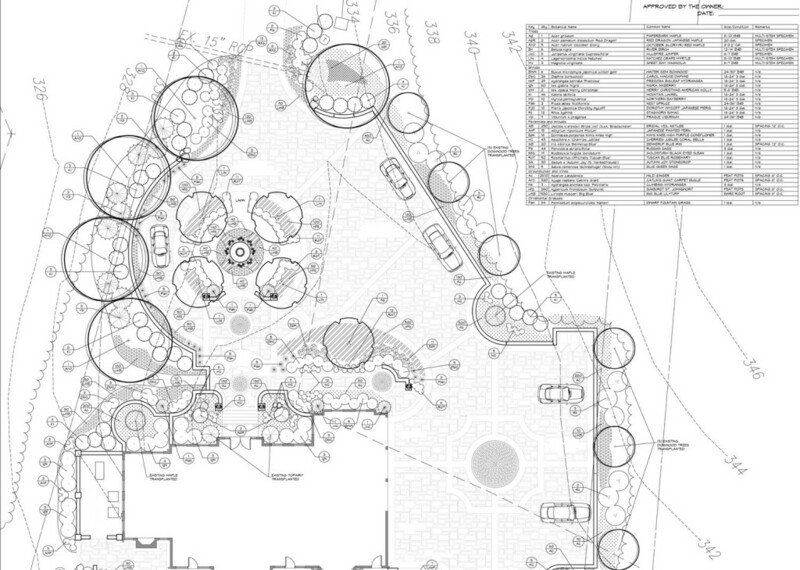 Because the site did not present unusual challenges, the landscape design could focus on the client above all else. 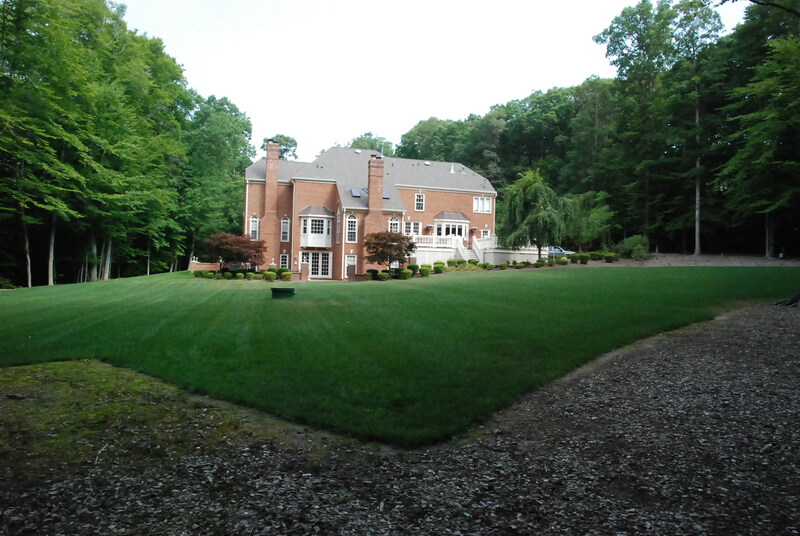 The formal style of the home called out for a traditional layout in the backyard. We created a generous patio space off the existing back deck and centered the pool across this axis. Opposite the pool from the home, a new brick pool house provides living space and amenities. We made every detail count. From matching the brick to the main house and creating complementary roof lines to coordinating trim details and colors we ensured that this pool house is an extension of the home – not an afterthought. We set out to amaze and delight the homeowner and we saw an opportunity to do so along the long axis of the pool. At one end we created a more intimate living space. An imposing stone fireplace, centered on the pool, anchors the ample conversation space. To allow the homeowner to use the spa in all kinds of weather, we constructed a roof structure above it, and that was our chance. 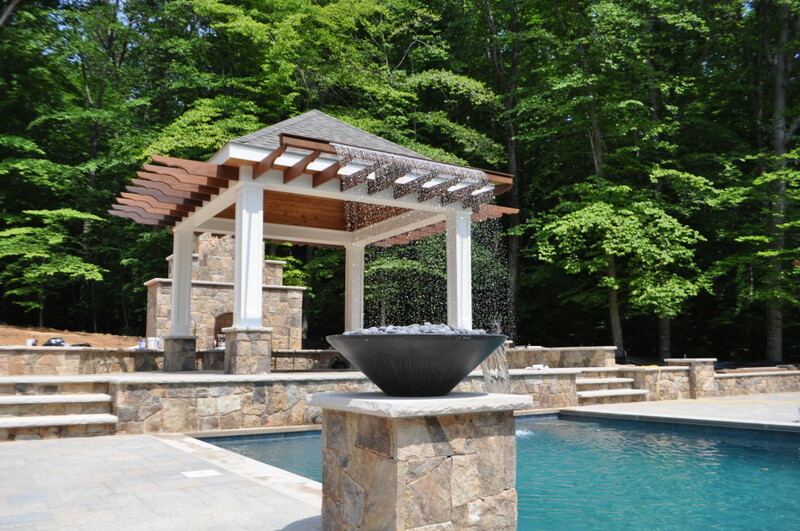 The homeowner wanted an acrylic spa because of the advantages that they have over a gunite spa – more therapy jets, easier to control temperature – but a square box, set on the pool deck wasn’t going to work for this site. We recessed the spa into the pool deck to give it a truly built-in look and feel. To create a sense of connection between the spa and pool we created a stunning, one of a kind rain curtain water feature into the pool. Fire bowls along the length of the pool finish off the resort feel for this backyard. A beautiful home with a stunning backyard deserves a grand entry, and that’s what we achieved here. 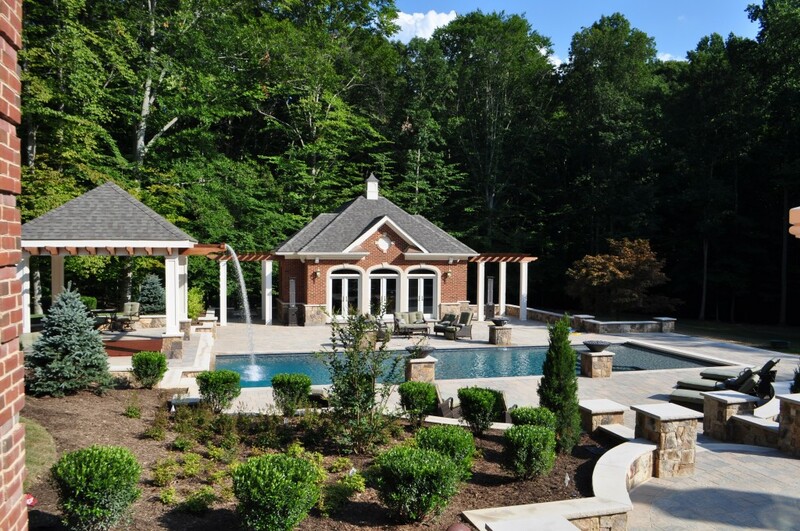 A Techo-Bloc paver driveway with formal plantings sets the scene for what reveals itself to be a stunning property. What can Land & Water Design do for your property? Whether you’re looking to transform your home into an outdoor resort or you have more modest goals, we work with our clients to understand what they want – and we show them what’s possible. Contact us today to learn more!